Brand Flights is proud to work with CertainTeed to create new tools for their business divisions to succeed. Here’s their press release featuring the launch of ComeTogether.CertainTeed.com. 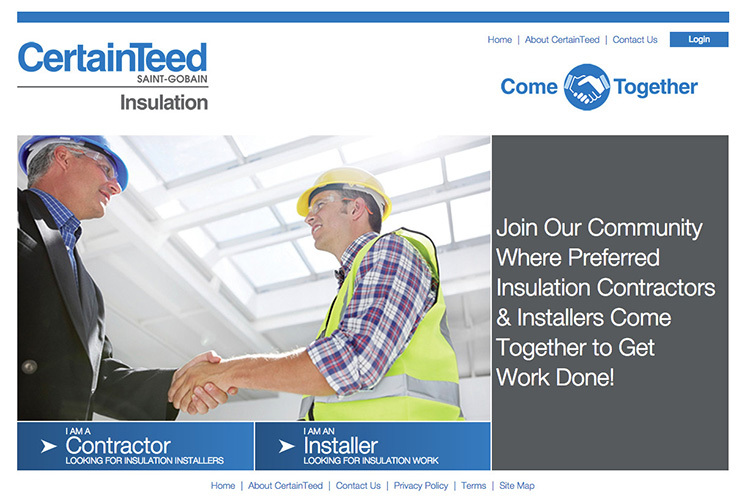 CertainTeed’s Come Together website is the key recruitment tool for the insulation marketplace. (Valley Forge, Pa.) – Insulation contractors have a new recruitment tool this year, thanks to an online job board and training center recently unveiled by CertainTeed. Come Together, the aptly named mobile-friendly website, quickly connects insulation contractors looking to hire with qualified insulation installers looking for work. “Recruitment and employee retention is a major issue our insulation customers face. Our Come Together recruitment tool, which can be easily accessed by computer or smart phone, helps bridge the gap between contractors looking to hire and qualified professionals looking for work,” said Shawn Beears, director of Contractor Sales for CertainTeed Insulation. Found at www.certainteed.com/cometogether, the tool gives insulation contractors a targeted means of finding and reaching out to qualified installers without having to spend a lot of their own time and money. The Come Together tool allows contractors to easily upload a company profile; post permanent, part-time or temporary jobs, including skills and certificates required; review installer profiles; and connect directly with installers they are interested in interviewing. The Come Together site is a benefit for installers, too, as they can tap into the free service to find work by searching for job openings with CertainTeed insulation companies in their area. They are also encouraged to upload personal profiles that provide hiring contractors at-a-glance details of their skills, years of experience, type of work sought and more. In addition, the site offers free online training that provides installers an overview of building science and the basics of insulation installation. “The Come Together tool is just one way we can help our insulation contractors grow their businesses. By helping them more efficiently find good installers, they can spend less time focusing on employee recruitment,” added Beears. Through the responsible development of innovative and sustainable building products, CertainTeed, headquartered in Valley Forge, Pa., has helped shape the building products industry for more than 110 years. Founded in 1904 as General Roofing Manufacturing Company, the firm’s slogan “Quality Made Certain, Satisfaction Guaranteed,” quickly inspired the name CertainTeed. Today, CertainTeed® is North America’s leading brand of exterior and interior building products, including roofing, siding, fence, decking, railing, trim, insulation, gypsum and ceilings.